‘Come Back to Erin’, ‘Mavourneen’ and ‘Erin’s National Anthem’. With the transfer of music books from the Hesburgh Library to the new Music Library in O’Neill Hall, songbooks and books on Irish music that are more appropriately housed with the Irish Collection have been transferred to the Hesburgh Special Collections. 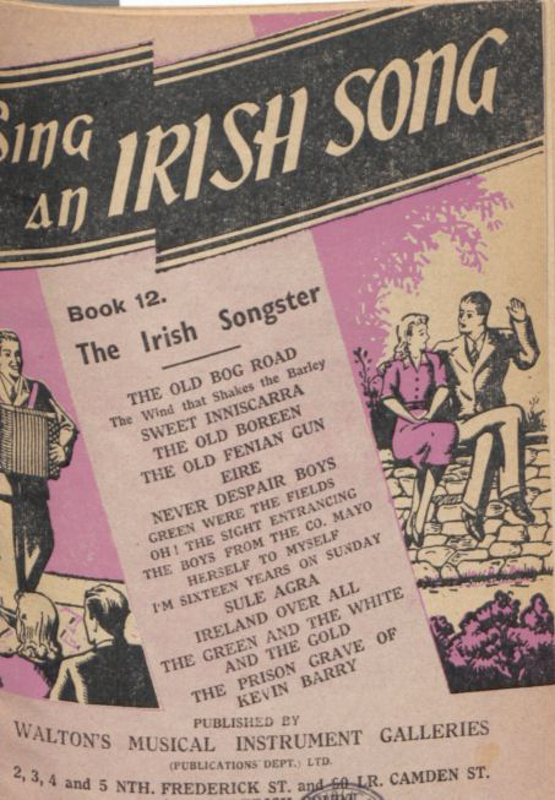 Among these books are collections of ballads (without music notation) such as the many books published by Waltons of Dublin, and also a selection of sheet music published outside Ireland. In the examples below, click on the images to open up a better view. 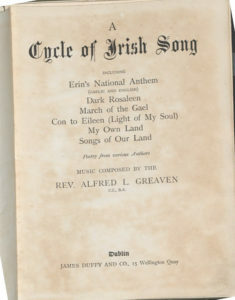 A Cycle of Irish Song, by Alfred L. Greaven. Dublin, James Duffy and Co., 1900. Tho only other U.S. copy listed on WorldCat is in Villanova University. I have found no information about the author other than the fact that he was a priest, and is listed in the National Library of Ireland’s catalogue also as author of a book, Irish Violin Makers: Some Brief Notes, published in Dublin by Gill, 1911. 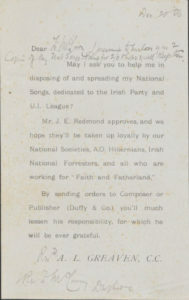 The note accompanying the book, donated by the Rev. Greacen, expresses the hope that the songs will be ‘taken up loyally by our National Societies, A.O. 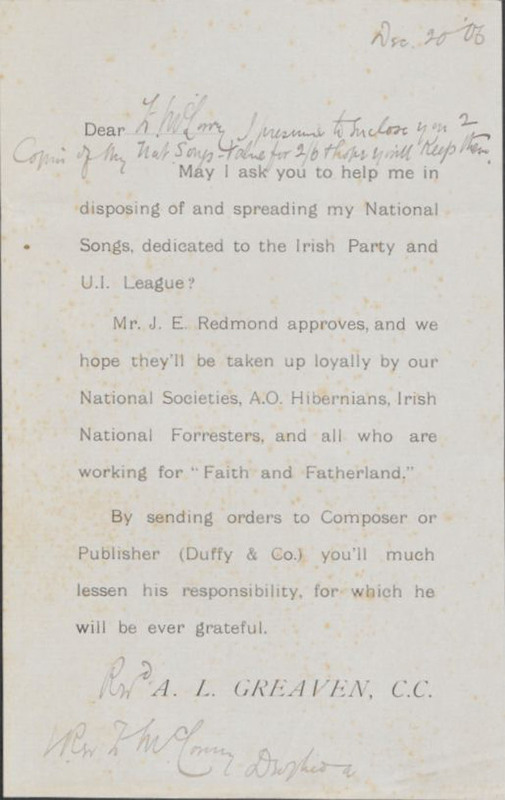 Hibernians, Irish National Foresters, and all who are working for “Faith and Fatherland”‘. 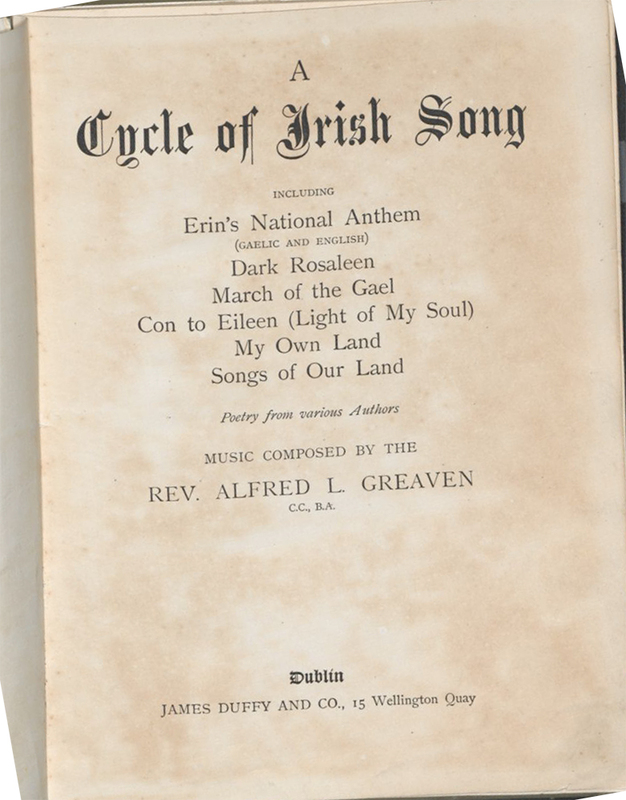 The anthem included here, ‘Erin’s National Anthem’, includes the music and verses in English by Rev. Alfred Greaven (referred to in the Irish text as An t-Athair A. Ua Gríbhthín), and the Irish translation, ‘Amhrán Buadha na h-Éireann’ by Andrew O’Duffy. Books such as Irish Fireside Songs published by Walton’s generally have no date information, but as Walton’s Music was founded in the early 1920s, we know that they were produced since then. 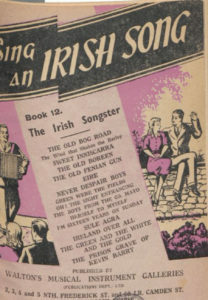 Irish Fireside Songs was a series of pamphlets, with covers in different colors, and selections of songs (words only), on different themes. At a cost of fourpence, or four times the cost of a daily newspaper, they were inexpensive, and quite ephemeral. Another Walton’s series, Sing an Irish Song, recalls the Waltons-sponsored program on Raidio Éireann, presented by Leo Maguire from 1952 until RTÉ ended its sponsored programmes in 1981. 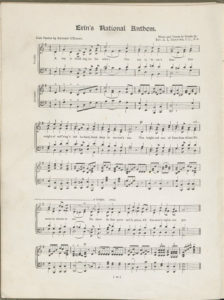 Of the sheet music that arrived from the music collection, many are songs composed and published outside Ireland, publications by British music publisher Boosey include ‘Mavourneen’, words by George Weatherly, music by Florence Aylward. . Other songs include ‘Husheen’ and ‘Come Back to Erin’. 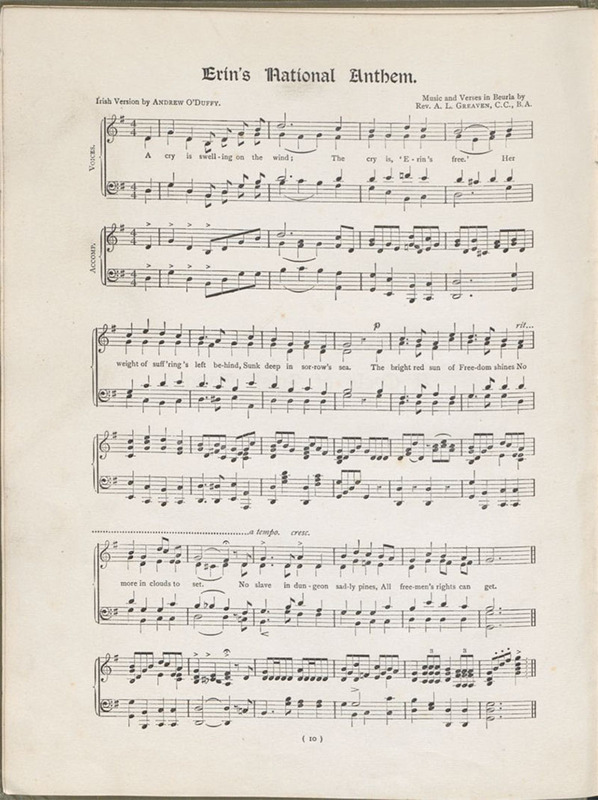 The ‘Mavourneen’ score is very rare, and our copy is possibly the only one in America. A very rare Dublin publication, this time from Pigott & Co., is shown at the top of the page. 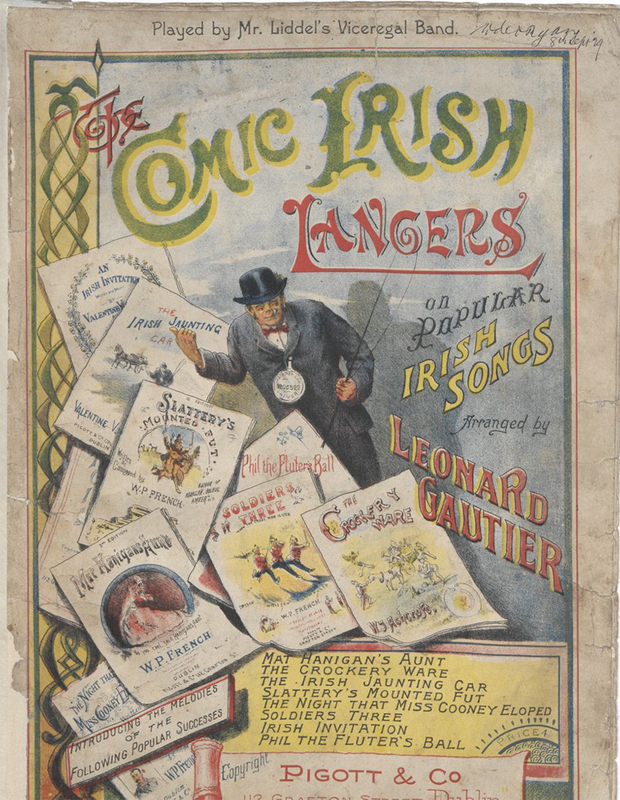 The Comic Irish Lancers on Popular Irish Songs arranged by Leonard Gautier. Played by Mr. Liddel’s Viceregal Band (top of page), the music is an arrangement of the following songs by Percy French, Valentine Vousden and W. S. Ashcroft: ‘Mat Hanigan’s Aunt’, ‘The Crockery Ware’, ‘The Irish Jaunting Car’, ‘Slattery’s Mounted Fut’, ‘The Night that Miss Cooney Eloped’, ‘Solders Three’, ‘Irish Invitation’ and ‘Phil the Fluter’s Ball’. This, again, is undated, and so we know that it cannot have been earlier than 1867 when John Riddell was appointed director of the Viceregal Band. Pigott & Co. were publishing music and songs from about 1866 also, and my best guess is that it was published between 1870 and 1890. 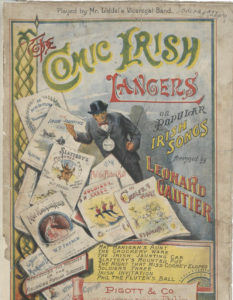 Color is unusual in these sheet music covers, although many have ornate writing and some have drawings or photographs. 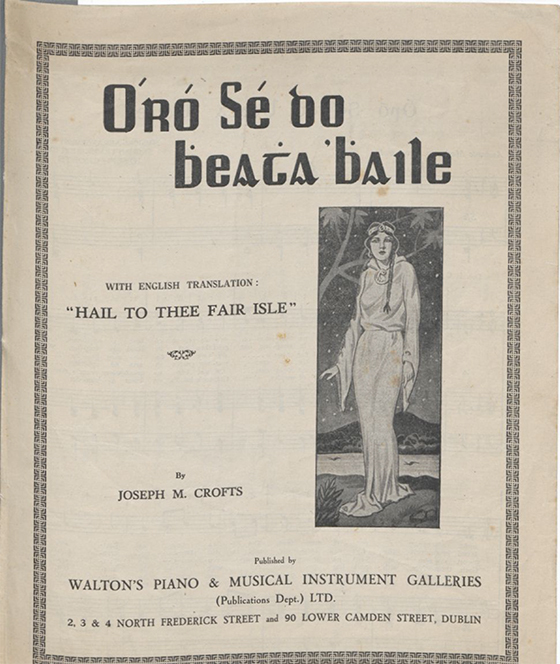 Also among the Irish publications, this time from Walton’s, and probably from the 1930s, is ‘Óró Sé do Bheatha Bhaile’, with Englsh translation: ‘Hail to Thee Fair Isle’ by Joseph M. Crofts. Crofts is the author of the English translation — the song is a traditional song, adapted by Pádraig Mac Piarais. Once again, a search through union catalog WorldCat shows only one other copy, this time in the National Library of Ireland. The songs in these books might never be performed again, but the songbooks and sheets are very interesting artifacts from their time.